Topher Grace has taken Peter Jackson's The Hobbit trilogy and edited it down to one single 2-hour movie. Jackson's three movies total 434 minutes, so Topher Grace trimmed a lot of fat from the films in order to put together his own cut. This is not the first time Grace has taken a beloved franchise and made his own fan-edit. The actor famously did it with the Star Wars prequel trilogy as well back in 2012, which he titled Star Wars: Episode III.5: The Editor Strikes Back. However, that cut, and this new one, will not be made available publicly for obvious copyright reasons. Topher Grace says that he decided to make the Hobbit trilogy edit after he came home from filming Spike Lee's BlacKkKlansman as a way to decompress. He was so drained from his portrayal of former KKK Grand Wizard David Duke in the film that he needed something to keep his mind occupied, especially once he saw that Duke was back in the news. He even admitted to being depressed over the matter. So, he decided to take Peter Jackson's massive Hobbit trilogy and pair it down to one 2-hour film. 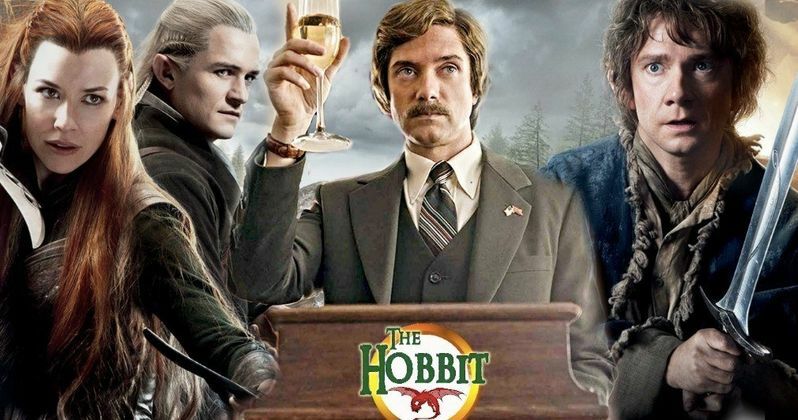 The Hobbit trilogy could have easily been made into one movie from the start, and many believe that the decision for a trilogy was influenced by money (all three films made nearly $3 billion at the box office), which Topher Grace agrees with. Grace decided to go back to J.R.R Tolkien's shorter source material and worked from that. The result is something that helped the actor out in a time of need and stretched some creative muscles as well. As previously noted, Grace's Hobbit cut will not be getting a public release. As for editing, Topher Grace says it's just a hobby of his and not something that he's pursuing to do professionally. As for fan-edits, the technology is out there and it's relatively cheap, so some of these edits come out and they're pretty impressive. While some are done for art and creativity, there are others that are made to be controversial, like the recent fan-edit that took Rian Johnson's The Last Jedi and cut all of the women out of the film. Now that Topher Grace took on the challenge of pairing Peter Jackson's Hobbit trilogy into one 2-hour movie, it may inspire others to do the same. Grace didn't say how long it took him to complete the full edit, but one has to imagine that it took many hours to complete. As for seeing the Grace cut of the film, you're going to have to be a good friend of the actor's to get a sneak peek at what he did in his spare time to decompress after playing David Duke in Spike Lee's BlacKkKlansman. You can read more about the Hobbit super cut as well as Topher Grace's thoughts on the trilogy over at Indie Wire.